Creality CR10 – Unboxing and First Prints! Please visit ift.tt/1PJb2UK for more information on this and many other projects! As in this episode, we will be unboxing and doing some first prints on the amazing Creality CR10! 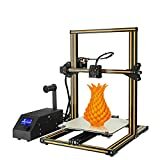 Check it out here as its an amazing printer! ← 3040 CNC – New Water Bath Design!